WASHINGTON – The Supreme Court Thursday sided with a Gilbert pastor who said the town’s sign restrictions were infringing on his First Amendment rights. 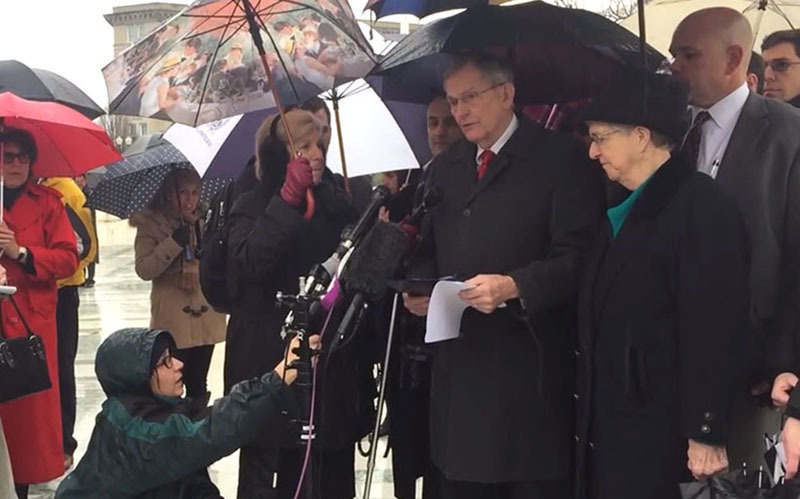 “Gilbert looks forward to the opportunity to review its own regulations to make necessary changes consistent with the Supreme Court’s decision,” his statement said. But state and national municipal groups predicted that the ruling would cause havoc for local governments. “Today’s decision … wreaks havoc on the ability of local governments to implement sign code regulations,” National League of Cities CEO Clarence Anthony said in an emailed statement. The Arizona League of Cities and Towns already has its attorneys reviewing the ruling, said Executive Director Ken Strobeck. That concern was addressed by Justice Samuel Alito in one of three concurring opinions in which a total of six of the nine justices joined. Alito, joined by Justices Anthony Kennedy and Sonia Sotomayor, said the court’s opinion “does not mean … that municipalities are powerless to enact and enforce reasonable sign regulations,” before listing several possible areas where restrictions would be allowed. 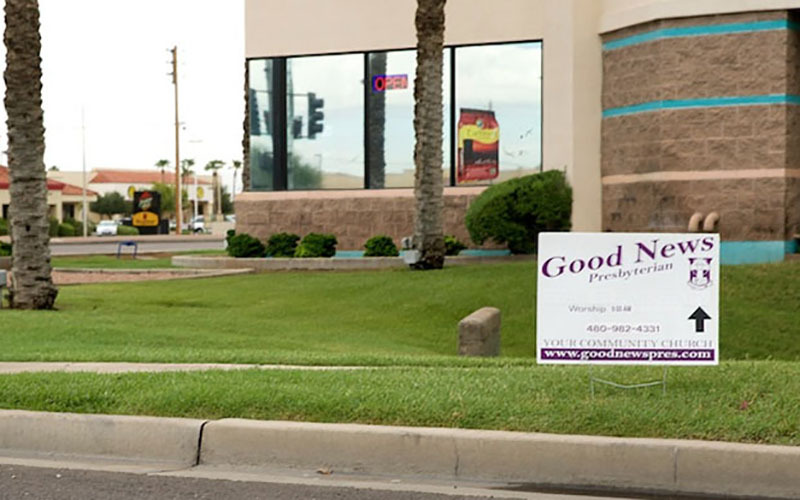 The Gilbert dispute centered around the use of “15 to 20 temporary signs in and around town, frequently in the public right-of-way” that Reed’s Good News Church put up with the time and location of the next service. Those signs were often put up a day or two in advance of services, which moved from place to place, according to the majority opinion, written by Justice Clarence Thomas. The Gilbert Land Development Code categorized the church signs as “temporary directional signs” that are limited to 6 square feet and only four on any one property, no more than 12 hours before an event. The town’s sign code compliance manager had cited the Good News Church twice, once for leaving signs out for longer than allowed, and once for not displaying proper information on the sign. After trying unsuccessfully to resolve the problems with the town, Reed sued in 2007, citing the difference in town restrictions on church signs and other signs. Political signs were allowed to be up to 32 square feet and could be displayed for an entire election cycle, Thomas wrote. Ideological signs were limited to 20 square feet but had no time restrictions. Lower courts ruled that because the restrictions were not based on the content of the signs, they did not infringe on the First Amendment. In overturning the 2013 ruling by the 9th U.S. Circuit Court of Appeals, Thomas sided with what he called a small, cash-strapped entity, and said “the restrictions for political, ideological, and temporary event signs apply equally” to the church or to another body. Reed was still trying to grasp the victory Thursday morning. “You take a little church that doesn’t have much money, and boy this is a big thing for them,” Reed said, before adding that his next step was to go out and plant more signs.